After reading Chris Bartram's review of A Hampshire Collection, I write to correct a misunderstanding. Chris states: "The tunes in MIDI format are published on their website: http://www.forest-tracks.co.uk/hampshirevoices/pages.hampshirecollection where you can also find links to recordings by Gwilym of most of the songs." I would like to point out this is not 'their' website. I created the Hampshire Voices website (www.forest-tracks.co.uk/hampshirevoices) to highlight the rich heritage of songs and music that has been collected in Hampshire over the past century. The concept and contents are mine. I put up the Hampshire Collection webpage (see below link) where the midis can be heard and a link to the webpage featuring Gwilym's solo CD, which was released on Forest Tracks. This might seem a trivial point but I am growing weary of seeing my work/research being incorrectly credited to others. Hampshire Voices is no more 'their' website than Musical Traditions is Chris Bartram's. Now here’s something that you all MUST watch! Thanks to Andy Turner for pointing it out this programme from BBC2 Scotland to me. Snatches and photos of all the heroes and friends are there; Jeannie, Lizzie, Belle, Sheila, Stanley (though the word ‘traveller’ is never used in the programme). Great memories stirred for me by seeing Willie Barclay Henderson and Bobby Jamieson from Cullivoe in Yell. The balance of the programme is towards the work of the collector rather than the informants but what is said about the changing style, methodology and accessibility of the SoSS archive. There were two brilliant purple patches in the programme for me. One comes at around 7mins 30secs with Prof Richard Finley expounding ideas of how embracing traditional culture raises a community’s self esteem and opposes global capitalism and cultural imperialism. The other comes around 21 mins and shows 1979 film of Andrew Rennie, an old blacksmith re-enacting all the parts of the Galoshins play ­ and then the way the Alasdair Roberts was incorporating this into his current work. This is only on IPlayer until December 7th so don’t hesitate in watching it. I found it an enormously stimulating programme even when I disagreed with what was said or with the emphasis that was put on the content. I'm just listening to an old Topic white label single with Kelly - The Boy From Killane on the A side and The Boys From Wexford on the B side. This is the never-issued STOP 108 (matrix 302A & 302B) which was then issued by Transatlantic on TRA / SP 2 with credits to Topic on the cover and the record itself. I don't know if it is relevant that Bill Leader was probably working for both Topic and Transatlantic at the time. It seems that from 1965 onwards most of the Ian Campbell group's records were issued on Transatlantic whereas their previous three 7" records and The Singing Campbells LP were all issued on Topic prior to the switch to Transatlantic. A Decca single and an EP slipped out between the change from Topic to Transatlantic. The new Sarah Makem 3-CD set is as fine as any you have issued under the MT imprint. What a pleasure to hear so many outstanding items. Even those of us who have been collecting music for forty years or more must surely find, as I did, unexpected material here. Can I point out items missing from both discography and the listing of her repertory? Cashing in on the international popularity of the Clancy Brothers and Tommy Makem, Vogue Records issued a vinyl album in 1968 under their Emerald Gem imprint. The contents consist of field recordings made in Ireland among both the Clancy and Makem families, with the chief focus on children's songs. The provenance of the recordings are not stated, though it is possible they were made by Diane Hamilton, as the sleeve states it to be, rather ambiguously, 'A TRADITION RECORDING' [sic]. Sarah Makem has three songs featured, only one of which is on your list. That same year Pickwick International issued a similar release on their budget Hallmark imprint. Possibly these items were recorded at the same time as those mentioned above, but on this occasion the thrust was less orientated towards children's songs. The May Morning Dew. Recorded 1952, issued 1975 - Folktrax FTX-161. As ever, a great job on both the magazine and CD issues over the past year, Rod. I have to agree with Ken Lees. Having seen the Rakes not many days ago I can confirm that they are playing well. It was a joy to see Michael now over the health problems which have beset him during the past few years. And a double pleasure to have been reminded just how effective a melodeon player Reg Hall is. Generally nowadays I only hear him at Bampton, where he tends (following his early influences, such as 'Scan' Tester) to play singalong material. Infectious dance music for certain. Do go along and see them in Trefusis, good readers. Maybe I'll see you there. I recently did a dance with the Rakes in Woodford Green Sports Club as part of the local Woodford Community Festival. We had a great time, and I thought the band was on good form. Following on from this I happened to mention to Peta Webb that it was a shame that with a band still playing so well, there were not more gigs around. It may have been coincidental that she had just taken retirement, but within a day or so a message came back saying that she had asked around and found that Trefusis, at C# House, was free on Wednesday night at what I thought was very reasonable price. The outcome of this is that I have booked a Wednesday night once a month up until my birthday on Wednesday 27th June. Whatever happens with this, at least we all have chance to hear the Rakes once more strutting their stuff. The Rakes had asked that Steve Roud should do at least some of the calling, so that's what we have on the first night. Download flyer. The dates booked so far are: 29th Feb, 28th March, 18th April, 23rd May, and 27th June 2012. Hi, Rod – I hope this finds you well. I suppose I’m being terribly pedantic, and I’m sure it’s not at all what Ken Ricketts and Marya Parker intended in their excellent review of the William Mullaly collection, but he was not “the only concertina player to be recorded commercially in the first half of the 20th century”. [You're right - he was the first Irish concertina player to be recorded - Ed.] No doubt it would be correct to say that he was the only traditional Irish concertina player who made records during that period, but many other concertina players recorded at considerable length. Alexander Prince seems to have been some kind of superstar, given the sheer number of records that he cut. He played a different variety of the instrument (the duet concertina), as did others who recorded prolifically, like Perci Honri, and there were others still who made records playing the English concertina. They all tended to be ‘readers’, I think, playing a wide repertoire of popular and light classical pieces, rather than traditional musicians. Mullaly played the Anglo-German concertina, and I don’t know enough to say whether there were any other commerical recordings of that type of the instrument. There was William Kimber, of course, although we wouldn’t describe his HMV 78s as commercial, in the sense usually employed for talking about early recordings. Having said all that, I started collecting Alexander Prince’s records years ago, until I finally admitted to myself that I really didn’t like them. I’d have gladly traded the substantial pile I had acquired for a single William Mullaly. Always enjoy looking in at MT – still excellent, still nothing like it! Sorry for the delay in writing, but I wanted to have a good listen to Fred's fiddle playing. I really had forgotten how good he was! There were just so many 'bad' English fiddlers (I'm speaking about the ones that were recorded) so the CD should really change some perceptions. We were shocked to learn of David Kettlewell's death. We owe him a great debt, for it was he who had the difficult task of pinning the often elusive Copper Family harmonies down and making music of them. These transcripts were then used and enhanced Bob's series of three books for Messrs. Heinemann. Indeed we used his transcriptions again when we produced The Copper Family Songbook although Bob produced new artwork. When the time comes to reprint the songbook it will be with a dedication to David, rather than an acknowledgement to him which it currently carries. When I read of David's remarkable interests and achievements it appears that he was a true polymath - we were lucky he was around back in the '70s to do such a great job for us. Please pass on the Family's sincere condolences to David's family and friends. I read Steve Gardham's excellent Bold Pirate article with great interest, partly because I've sung his Version A (the Joseph Elliott version) for many years. Steve wonders why it is that the song turns up predominantly on the Canadian eastern seaboard and along or near the south coast of England. For Joseph Elliott, at least, the link between these two areas is clear. In about 1850, when he was around 19 years old, he signed on as a fisherman in the Newfoundland cod fishing industry, sailing out from Dartmouth with about 60 other men (mainly men from Dorset). He was out there for 3 or 4 years, and told the Hammond brothers that that was where he learned his songs. Possibly he heard it from one of the many Scots who settled there. Joseph Elliott was one of many from the south and south-west who went to sea for a short period, then returned to work as agricultural labourers for the rest of their working lives. Some of the other singers from the southern counties who sang The Bold Pirate may have done the same, or may have heard the song from someone who had. Just to say "thank you" for publishing the Enthusiasms piece on Shiyani Ngcobo. I know that you reviewed his album back in 2004, but it passed me by at the time. I have now bought a copy and can only say that it contains some of the strongest music that I have heard in years. It really is a gem! I am surprised that MT does not get more positive feedback. You have really done so much over the years in promoting music that would otherwise have remained relatively unknown. Once again, my thanks. A few notes to follow up on Mike Yates’ interesting article Awake and Join the Cheerful Choir. Mike provides the texts of the songs included in the Reverend Hill’s book. Readers may be interested to see the tunes for the songs, and these are available on the Wiltshire Community History site at: http://history.wiltshire.gov.uk/community/folksongsintro.php From here it is clear that the Britford Second Carol - Awake and Join the Cheerful Choir, is indeed the same as that on the LP Under the Greenwood Tree and included in Dave Townsend’s The Mellstock Carols. The notes on the carol in Dave’s book give the source as a manuscript belonging to W C Cocker of Piddletown – so known to Thomas Hardy’s family, rather than coming from one of their surviving music books. Dave has made use of other Dorset sources in compiling the four-part version in the book, including the George Hanford Book which Mike mentions. Another Dorset version of the song can be seen at: http://www.hymnsandcarolsofchristmas.com/Hymns_and_Carols/awake_and_join_the_cheerful_choi.htm This version is reprinted from A Collection of Dorset Carols by W A Pickard-Cambridge (London: A W Ridley & Co, 1926); although the words are the same, it is set to Lyngham, a well-known tune which is completely different to that sung in Britford and Piddletown. The Britford First Carol is a new one to me, and all I’ve turned up on the web is a slightly longer set of words, under the title An Hymn for Christmas Day, from Psalms, hymns, and anthems; sung in the chapel of the hospital, for the maintenance and education of exposed and deserted young children (1797). Whether that publication printed just the words, or words and tune, I’m afraid I can’t say. Finally, returning to the Wiltshire Community History site, searching for songs where Britford is listed as the source, one other carol comes up. This is Blessed are the Sons of Peace, reproduced from Glyn Court, Carols of the West Country, (Westcountry Books, 1996). I’ve obtained a copy of that book from an online supplier, but while it contains some interesting material, the source given for this Britford carol is another modern publication, Wiltshire Folk Songs compiled by Celia Cologne and Jean Morrison (Wiltshire Folk Life Publications, 1981). As a former Wiltshire resident, perhaps you have a copy of this book? Or maybe another Musical Traditions reader has access to the book and could provide us with the source of this carol. Mrs Stradling and I are eager to hear a track from Volume 8 (A Soldier's Life for Me) of the Folksongs of Britain set of LPs produced by Caedmon and re-issued by Topic. The track concerned is The Bonny Bunch of Roses by Louise Holmes. If anyone has that LP and can make an MP3 of the track and send it to me at: rod@mustrad.org.uk we'd both be extremely grateful. Thanks to all - we now have 6 copies of the recording. No more please! I very much enjoyed reading the excellent and informative article by Mike Yates, 'Awake and join the cheerful choir', concerning the Rev Geoffry Hill. The standard of articles on Musical Traditions is consistently high, and this is no exception. Quite; the mystery would have been if Rev Hill had been a clergyman at any other sort of church in Scotland. That would at the time probably have indicated that he was no longer an Anglican priest. There are, obviously, no Church of England churches in Scotland. Perhaps Mike was suggesting that the mystery was why Hill moved to Scotland. However, Anglican clergy, such as those of the Church of England, Scottish Episcopal Church, Church in Wales and Church of Ireland quite often move to other provinces of the Anglican Communion, of which there are now 38 in total including those in Canada, the United States, Australia, and all over the world. As far as I know, clergy trained and ordained in England can in theory exercise their ministry in any province if they obtain a post. Perhaps Hill saw the job advertised in the Church Times and applied for it? I hope these comments may help to clarify that particular passage in the article. Thank you for publishing Gordon McCulloch's review of my book The Eskimo Republic. I agree with quite a few of his points, and hope he is feeling better now. I wonder if your viewers may be interested in the attached photographs and have any comments on them. First, a little background. I only found out five or six years ago (thanks to Shirley Collins having sung Lord Allanwater and correctly crediting her source) that my great grandmother, Emily Agnes Stears, had been 'collected from' by Ralph Vaughan Williams in Horsham around 1904. To pass the time whilst at my mother's house over Christmas, I got her to dig out various boxes of ancient family photos - she's heavily into genealogy - and so uncovered these which I'd never seen before. Emily Agnes Stears' father-in-law Thomas Stears (1844-1903) remarried after being widowed and moved to Bonchurch in the Isle Of Wight. He produced 8 more children and ended up as headmaster of the small village school. I have one photograph of him trimly but darkly bearded with a number of his grown up children, and another on his own, by which time his beard had turned white. I'm not an expert on beard whitening speeds so let's suppose that if that pic was taken at the end of his life, 1903, the family group would be earlier, say 1900. 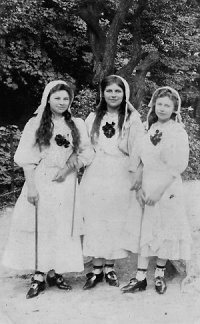 Two of the daughters in that family group appear in this one attached, obviously several years younger still which could date it circa 1898 - which appears to tie in with known ages. As you can see, they are wearing some sort of dance costumes, have (morris?) bells on their ankles and are all holding (thin) sticks. I sent this picture to Georgina Boyes who commented that The costumes worn by the three girls are spot on for the Esperance-influenced stage of the Revival, right down to the shoe buckles and ankle bells. But Mary Neal didn't start all that 'til 1904, at least 6 years later. 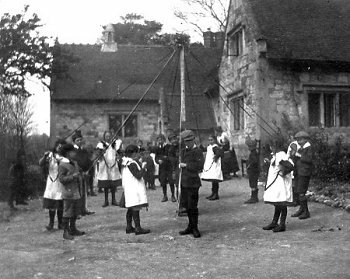 I also turned up the other pic of maypole dancing outside the school in Bonchurch. The date is unknown, and I have no idea if any of the daughters are included (if they were, they'd be a lot younger still). So: any comments on the spread of 'Esperance-style' costumes pre-Esperance, pre turn of century? Does anybody know of a hive of folk dance interest in the Isle of Wight at that time? I (possibly erroneously) imagine that to have been the back of beyond in the 1890s, though I have seen reference to there being grand mansions around Bonchurch. Perhaps these were summer retreats for the moneyed classes, so maybe there were incomers.